Hello Gonzalo. 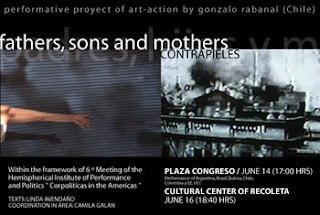 I just met your webpage from Deformance Biennal and I saw here Mothers Fathers and Sons. I think probably family is a current issue in contemporary questions. I've been in Chile recently in Brave New World festival, I couldn't meet/find more artists, but now I am researching on the internet and contacting people.